Several of us are moving down the lake and setting up Friday about noon at the fire lane next to Harry's house. The plan is to scout the main lake with hopes of scrub racing there. We can always sail back up to Tonka Bay if the main lake is not safe or if it's too rough. First boats on the ice must scout the main lake. The main lake has not ben sailed or scouted. 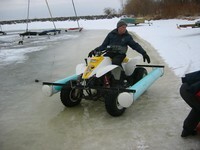 Nobody knows if the ice on the main lake is safe. SCOUT THE ICE BEFORE YOU VENTURE OUT. Never sail alone. Wear ice picks.